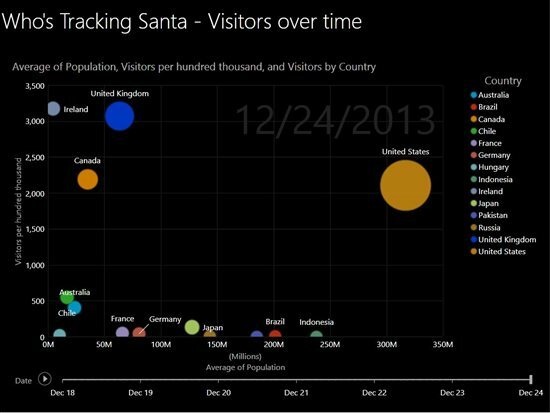 As we get closer and closer to the holidays, the Power BI team wanted to answer one of the most popular questions of all time: Where’s Santa now? Social media was the perfect source for answering question. We ran a search of the following terms and hashtags on Twitter: “santa sighting”, “saw santa”, #santasighting and #sawsanta. 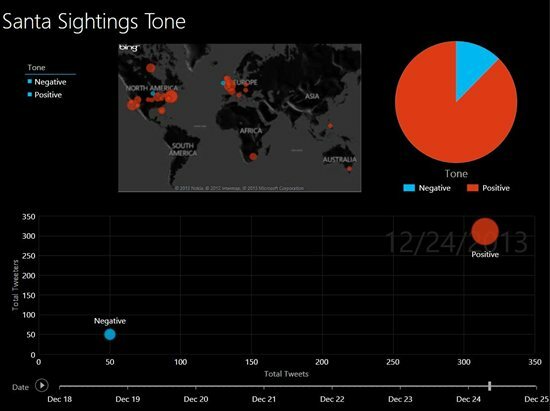 After importing the data into Excel and creating a Power Pivot model, we used Power View to visualize sighting tweets and where are they coming from, including hashtags, tone, retweets and platform among other data points. 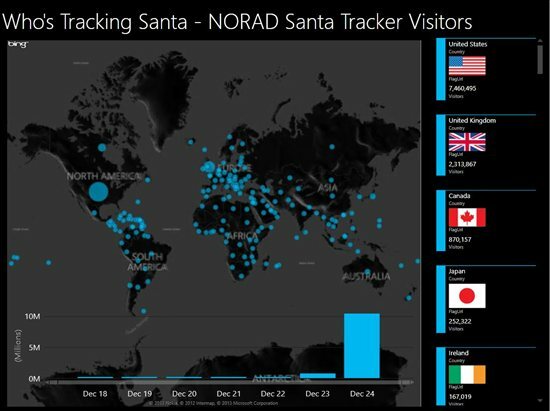 Even more, using the NORAD Santa Tracker online traffic data, we wanted to gauge worldwide interest in tracking Santa before December 24th. To start, we imported web traffic data into Excel, searched for country population using Power Query online search, created a small and simple data model to calculate visitors per capita and used Power View to visualize the results worldwide for the last 7 days. Most Santa Tracker visitors over the last 7 days came from the US, UK and Canada, but surprisingly Japan is in fourth place for Santa fans. As we get closer to Christmas Eve, more people around the world are interested in tracking Santa. An estimate of 5 to 10 million visitors worldwide will track Santa on December 24th. Santa sightings are happening all around the world too. The most popular tweet text is “saw santa” by far, followed by “santa sighting”. Most of these sightings have happened in North America and Europe, with three coming from the North Pole! As a present, you can download the file and play around with it yourself. Get more insights on when and where Santa is being tracked and explore Santa sightings around the world. Of course, that’s not all we have in store for you this holiday season. Don’t forget to come back on the 25th to see Santa’s flight with Power Map and to get an updated version of Santa sightings and how many people tracked Santa on Christmas Eve. 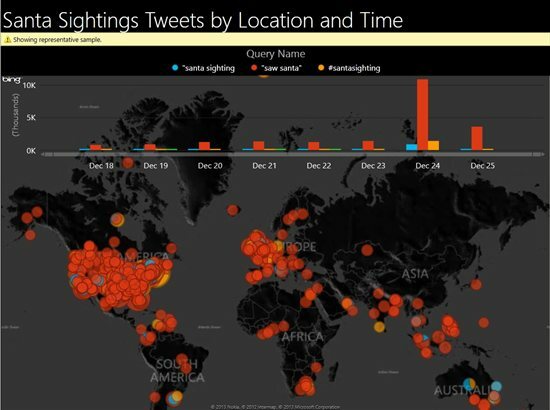 Happy holidays from the Power BI Team!